Mumbai, October 12 2016: The Board of Directors of IndusInd Bank Ltd. today approved and adopted its Unaudited Financial Results for the second quarter and first half-year ended September 30, 2016. Net Interest Income (NII) was Rs. 1,460.31 crores as against Rs. 1,094.28 crores in the corresponding quarter of the previous year, registering a robust growth of 33 %. 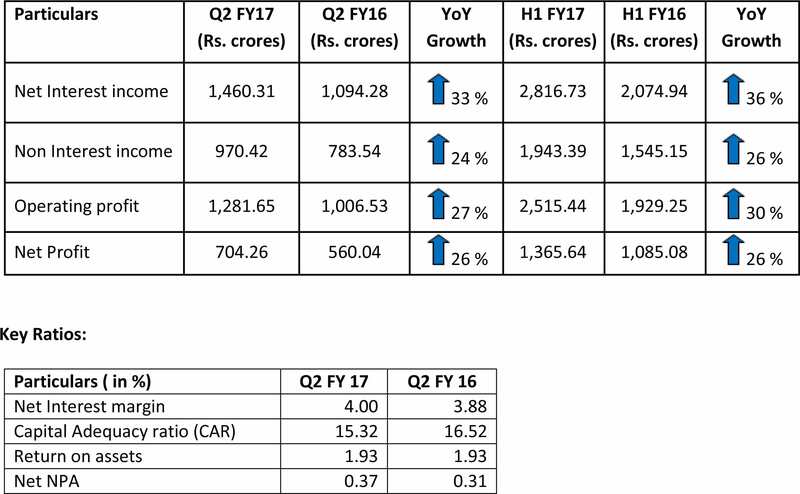 Operating Profit for the quarter was Rs. 1,281.65 crores as against Rs. 1,006.53 crores in the corresponding quarter of the previous year, showing a growth of 27 %. Net Profit for the quarter was Rs. 704.26 crores as against Rs. 560.04 crores in the corresponding quarter of the previous year, showing a growth of 26 %. Net Interest Margin (NIM) for the current quarter was 4.00 % as against 3.88 % in the corresponding quarter of the previous year. Net Interest Income (NII) for the half year ended September 30, 2016 was Rs. 2,816.73 crores as against Rs. 2,074.94 crores in the corresponding period of the previous year, registering a robust growth of 36 %. Operating Profit for the half year ended September 30, 2016 was Rs. 2,515.44 crores as against Rs. 1,929.25 crores in the corresponding period of the previous year, a growth of 30 %. Net Profit for the half year ended September 30, 2016 was Rs. 1,365.64 crores as against Rs. 1,085.08 crores in the corresponding period of the previous year, showing a growth of 26 %. Net Interest Margin (NIM) for the half year ended September 30, 2016 was 3.97 % as against 3.78 % in the corresponding period of the previous year. CASA (Current Accounts- Savings Accounts) Ratio improved to 36.53 % against 34.74 %. Total Advances as on September 30, 2016 were at Rs.98,949 crores as compared to Rs. 78,294 crores in the corresponding period of the previous year, recording a growth of 26 %. Total deposits as on September 30, 2016 were at Rs. 1,12,313 crores as compared to Rs. 80,841 crores in the corresponding period of the previous year, up by 39 %. Total Business at Rs. 2,11,262 crores. Net NPA as on September 30, 2016 was at 0.37% as against 0.31% as at September 30, 2015. Increase in network to 1,035 Branches and 1,935 ATMs as on September 30, 2016 as against 854 Branches and 1,578 ATMs as on September 30, 2015. IndusInd Bank, which commenced operations in 1994, caters to the needs of both consumer and corporate customers. Its technology platform supports multi-channel delivery capabilities. As on September 30, 2016, IndusInd Bank has 1,035 branches, and 1935 ATMs spread across 635 geographical locations of the country. The Bank also has representative offices in London, Dubai and Abu Dhabi. The Bank believes in driving its business through technology. It enjoys clearing bank status for both major stock exchanges – BSE and NSE – and major commodity exchanges in the country, including MCX, NCDEX, and NMCE. IndusInd Bank on April 1, 2013 was included in the NIFTY 50 benchmark index. Recently, IndusInd Bank ranked 13th amongst the Top 50 Most Valuable Indian Brands 2015 as per the BrandZ Top 50 rankings powered by WPP and Millward Brown.